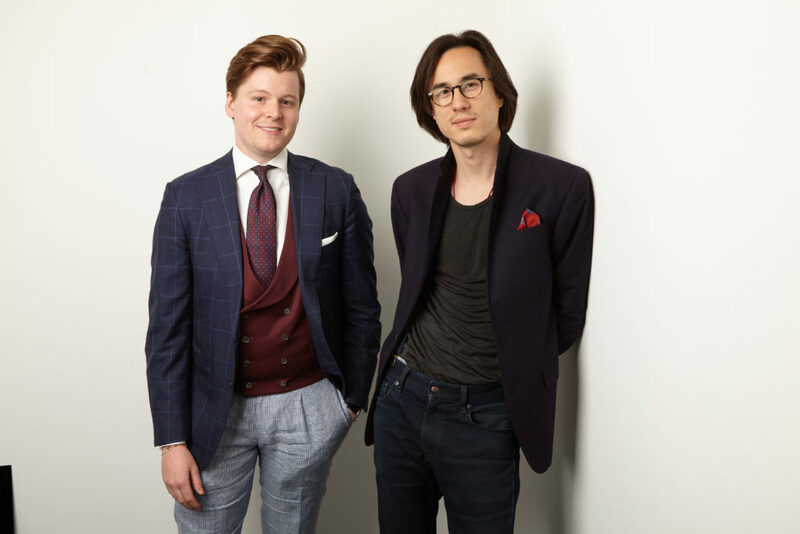 Baudoin & Lange was founded by Allan Baudoin and Bo van Langefeld in 2016. 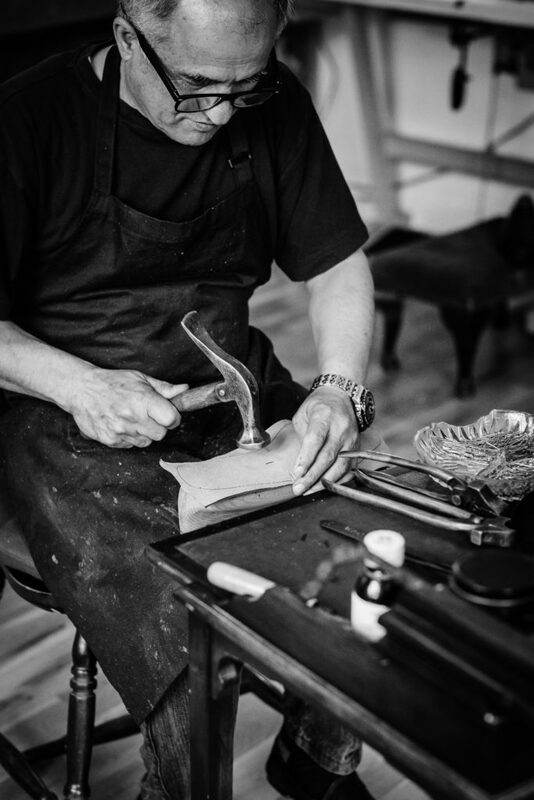 With a general appreciation for shoes and craftsmanship Allan, a former computer specialist and Apple alumni, decided to self-teach bespoke shoemaking in order to create loafers he could wear comfortable on a daily basis. The other founder, Bo, a former racing driver turned financier, got so fed up with wearing his mandatory business shoes that when both came together with the goal in mind to create both a stylish and comfortable loafer, the Sagan was born. In 2014, the first “Sagan” was produced and is inspiration of the model that was later launched in 2016. It came in black. This particular model is put in a glass box and stored, to be kept as a memory of how it all came to be. 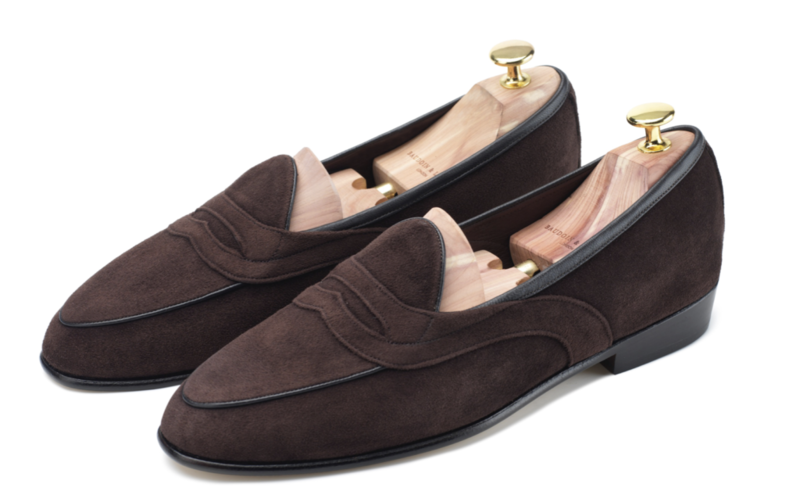 Let’s take a closer look at what makes this loafer so special. 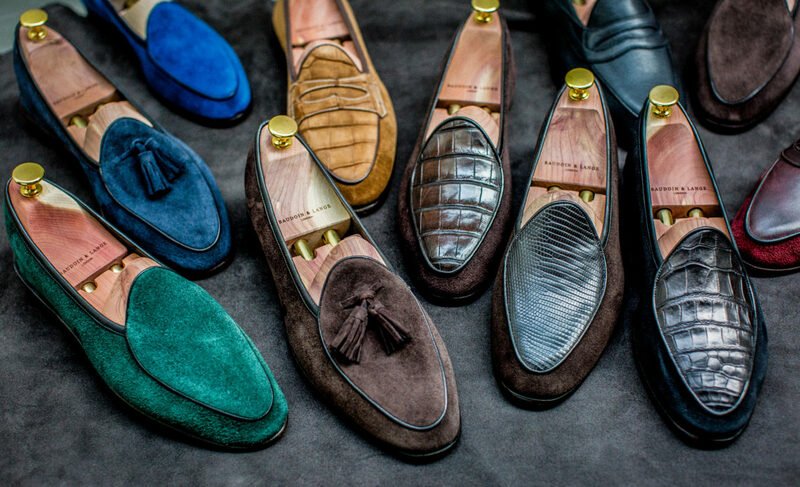 At first, you see a close resemblance to the Belgian loafer as it essentially is a house slipper. Then, on a second glance it is COMPLETELY different for several reasons which we will cover now. 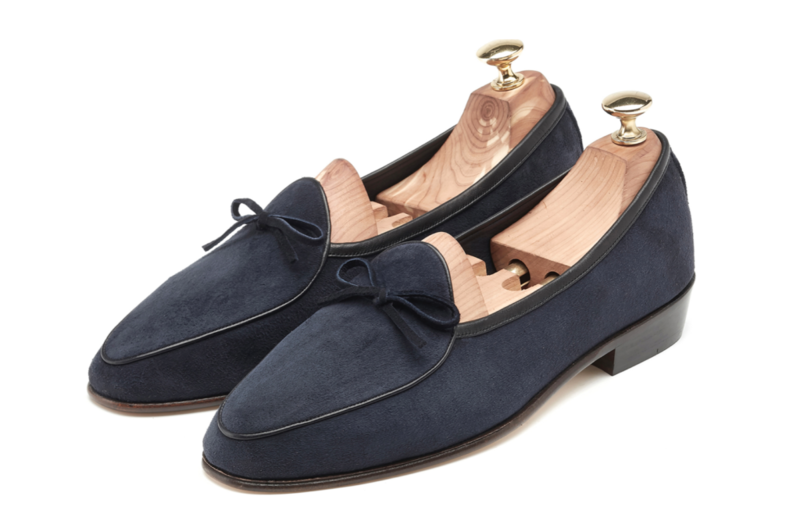 The Belgian loafer is more round, often comes with a tied bow and, as with a simple structured sole. Quick history of Belgian Loafers… In the 1940s, the man who brought Chanel to the US, Henry Bendl, designed a loafer with a 300 year old cobbler brand from Belgium who designed the shoe in the “turn around” method. This means that the loafers were meticulously made from the outside and the inside. They quickly became a favorite amongst the well dressed society of the 60s and were worn from New Yorker aristocracy to Beverly Hills flamboyancy. The shoe became synonymous with comfort and coolness. There have been many different interpretations since, however, the Sagans by Baudoin & Lange made a few changes making it stand out even more. Whilst the wooden sole is a genuine blakestitch, the founders wanted to bring the English tradition of a Goodyear-welt into their design. As this would have meant to create an extra layer and most likely, would’ve changed the design of the model, they did something rather exquisite. 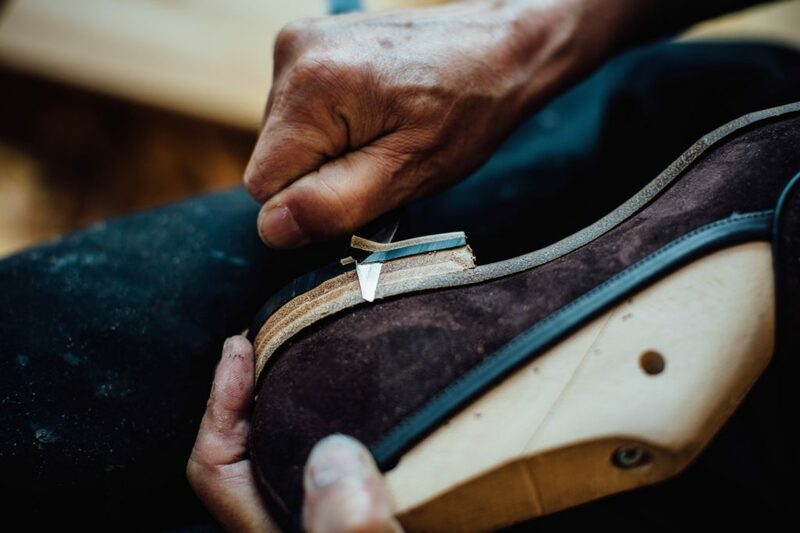 Instead of using Cork in the sole, they used cork in a special inlay which should add extra comfort and mould to your feed when worn over time. 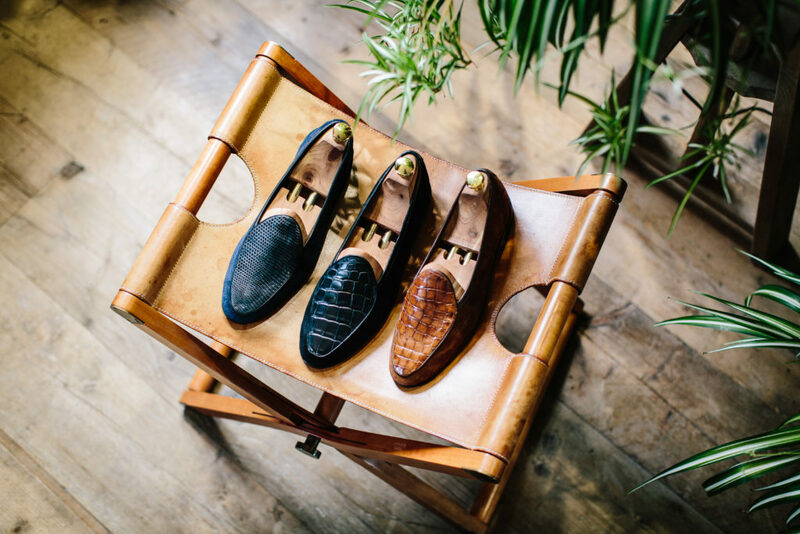 The result was a Belgian loafer with a slimmer silhouette and because of that innovative use of a cork inlay sole, the bridge between English shoemaking and sneaker-like comfort became realistic. 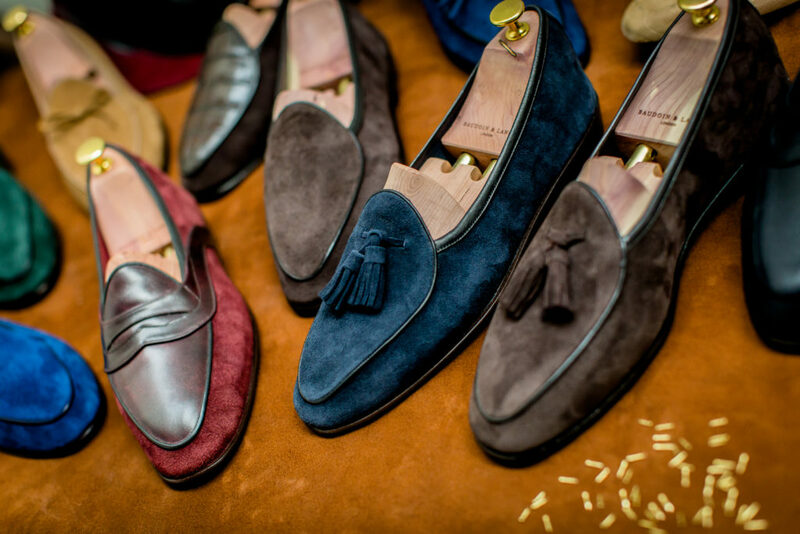 Furthermore, the suede and (later) leather used, is not your usual material weight you would find in your normal dress shoes. 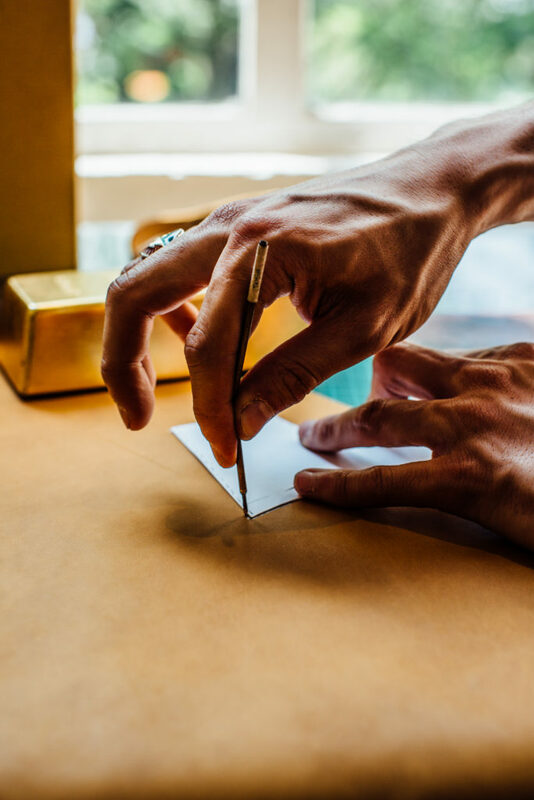 Instead of using the more popular route of calfskin, the company opted for lambskin. The much softer leather is most commonly found in accessories such as gloves and bags. 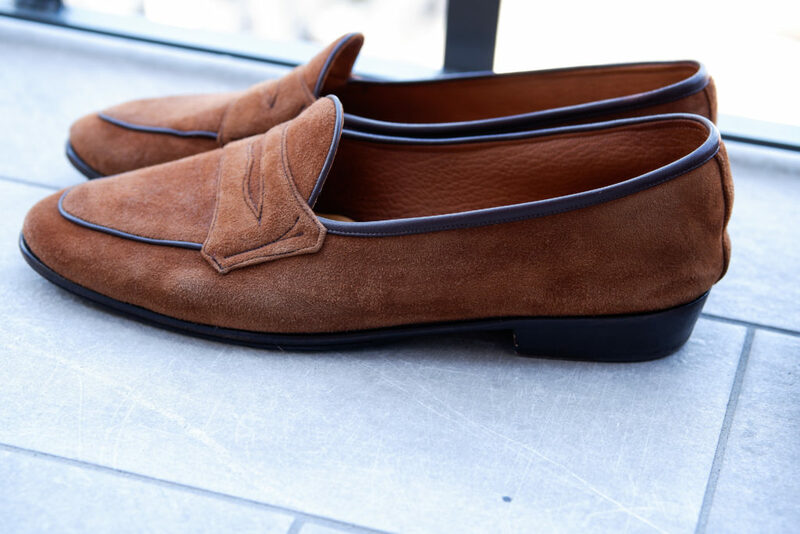 The result, in combination with the unlined loafer, is an immediately soft feel that is incomparable in today’s dressier shoes. It is actually quite surprising that lambskin is used, as most are of poor quality and usually have a short life span. However, it seems the brand uses some magic lambskin because boy, is it soft and strong!!! 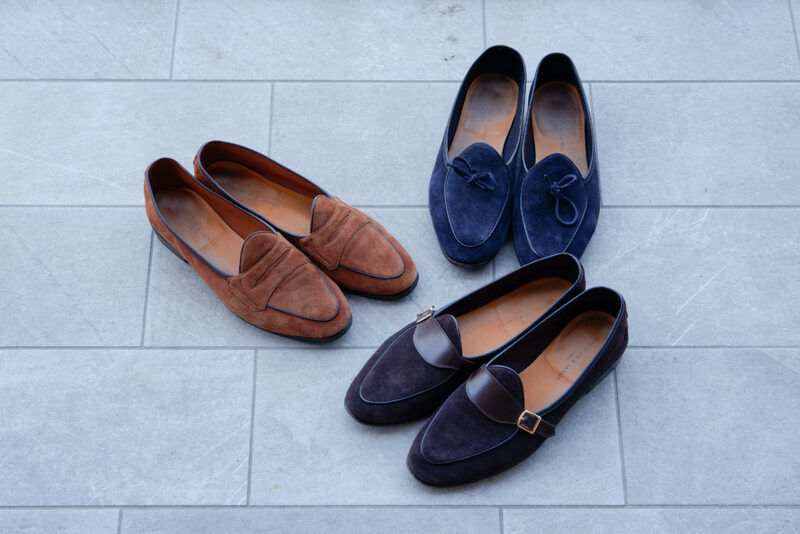 With skilled shoe makers, with over 20 years of experience, the brand produces its signature loafer with love and care up to a very high standard adding few definitive touches to the end product. Due to the loafer being unlined, the top has been “binded” (please find me a better word!) in leather, keeping it firm. Whilst most makers tend not to give too much attention, in a Sagan, the binding is sown down on both sides and therefore does not show any excess fabric. I find it amazing that, all though the loafers are on a rather slimmer sole than I’m used to, I can walk for hours without getting hurt feet. This often happens in more dress sturdy leather shoes. After having read up on insights and a bit of research, I found out that Baudoin & Lange use a sort of cushion under the heel that absorbs the vibrations you would get when walking. Together with the supported sole, it is a winning combination of craftsmanship, style and comfort. Now, this is something I do wanted to mention. I could very well be one of the few to have tried and owned both sizes 43 and 44 (thats UK9 and 10). Due to the soft structure and material, I fit in both sizes. Of course, the larger one gives me a bit more room but the fact still remains. The midnight blue string loafer was my first pair and has since seen the most wear by far. Whilst the front looks well molded and adjusted to my feet, the back is slipping over a bit. I have to say that it really doesn’t bother me all too much. The fit isn’t too snug and now, has really taken up the DNA of my feet. When trying my usual size 44 (I have this stupid habit of thinking my feet will shrink so I take a 43) the fit was very nice. In a 43, the fit was tight (to be expected) but loosened up once confronted with warmth. I noticed, since the leather used is so soft, that when you do take a size too small, the material overlaps the heel, as explained. In a size 44 however, this until now, does not seem to be the case. Therefore, in this particular case, it might be wiser considering the length of your feet instead of the width. Depending on your feet width, go with what is most comfortable. In the size 44, it was not too tight but comfortable enough not to fall off my feet. Once I got into the model, I noticed I had a bit more space in front than with the 43. I had to train my feet to understand that space is a GOOD thing! 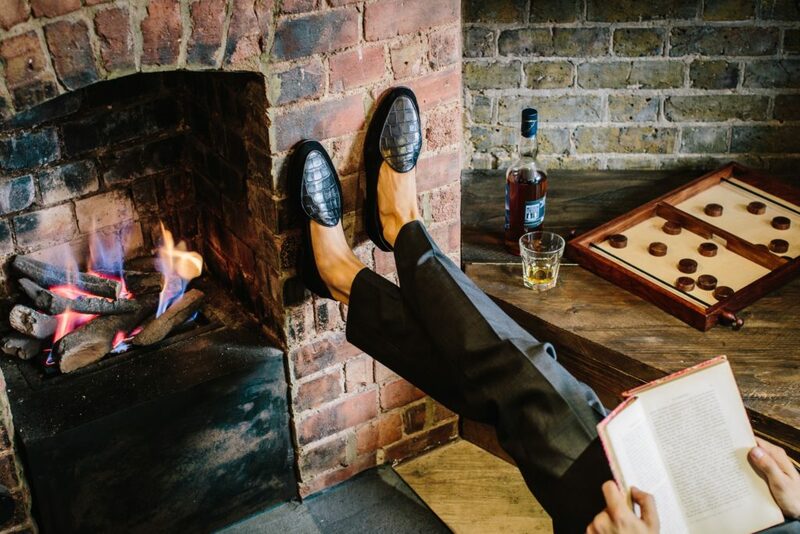 Furthermore, unlined loafers do tend to look a bit flat and unwanted at a certain time in their life. Having worn the monk strap model for the better part of a month now, I can confidently say that they haven’t lost their shape. In fact, the fit is still snug and unique. In the beginning my thinking was, due to my bulky physique and everything a bit wider in the legs, that this shoe was not for me. Boy, was I wrong! After 3 pairs of loafers, I can say that I was bitten by the “Sagan bug”. To me, they are your ultimate summer loafer! Wear it out in the city or at the beach. I do say summer, because I did wear them during the colder months, but for me, they just looked a bit out of place. Mostly because it got very cold as well as snow and rain are not suitable for such a pair of loafers. They are butter soft and a sturdier shoe in colder moments is perhaps more convenient. On other people though, they looked rather good so it really depends in which way you are leaning towards. Although being quite fitted and slim, I am impressed how well it looks on my feet. I have also seen others wearing them with wider feet than mine and they even seem to work on them. That is something I did not expect and do consider a big plus for the company. Baudoin & Lange Sagan’s coming in different colors and materials. A popular alternative are exotic leathers such as crocodile and lizard. The classic model is clean whilst others come with tassels, strings and penny loafer style. Their most recent is their new model called the “Sagan Grand”. 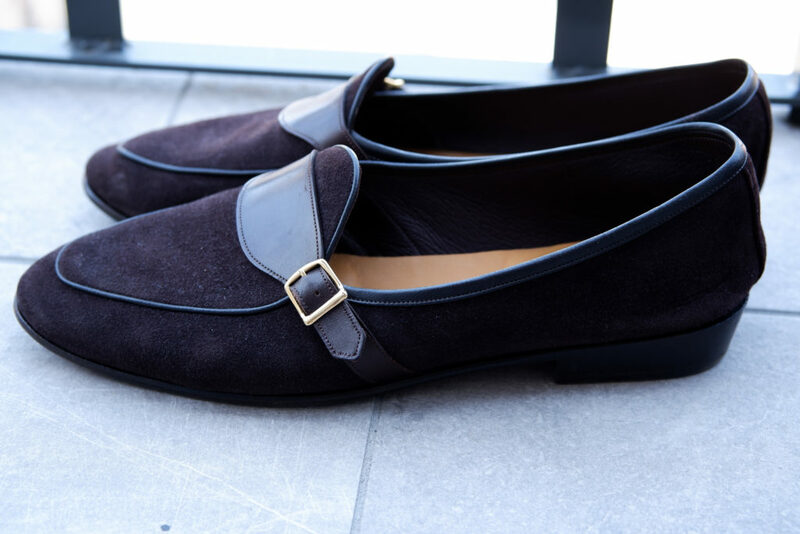 It will rival your normal business loafer but with the same construction and quality of their classic style. The leather used is a baby calfskin, making it equally soft and durable. For now they are made in the usual colors of black, brown, Bordeaux and chestnut. A suede model of the Grand is in the planning. This, the brand announced in a Q&A on Instagram. Their shoes are all hand-made in their atelier in London and therefore upon ordering, you will be asked to wait around 3 weeks for production. 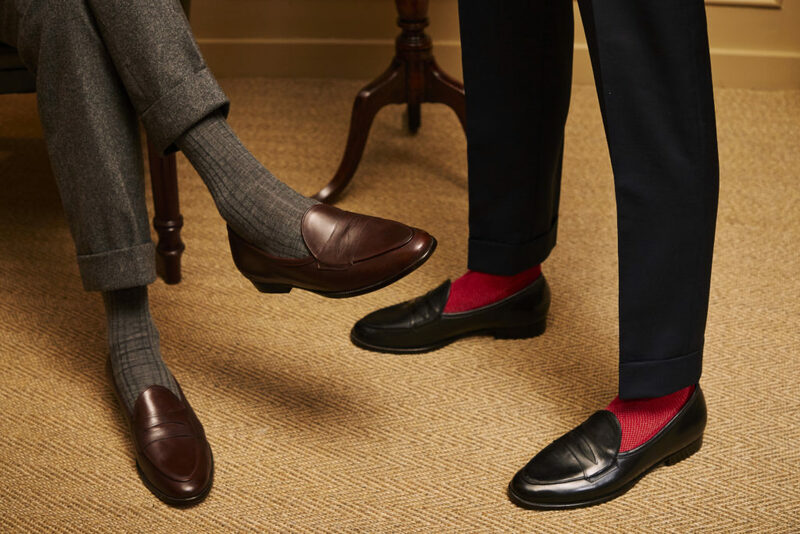 Having ordered three pairs from Baudoin & Lange, the service was always very clear, straight forward and the team is nice to talk to over e-mail if you have any concerns (Something I find super important if you have to wait for an order). Currently, they also have a limited stock in basic colors in all sizes, ready for next day delivery. Furthermore, you have a choice with a normal sole or a rubber sole grip. 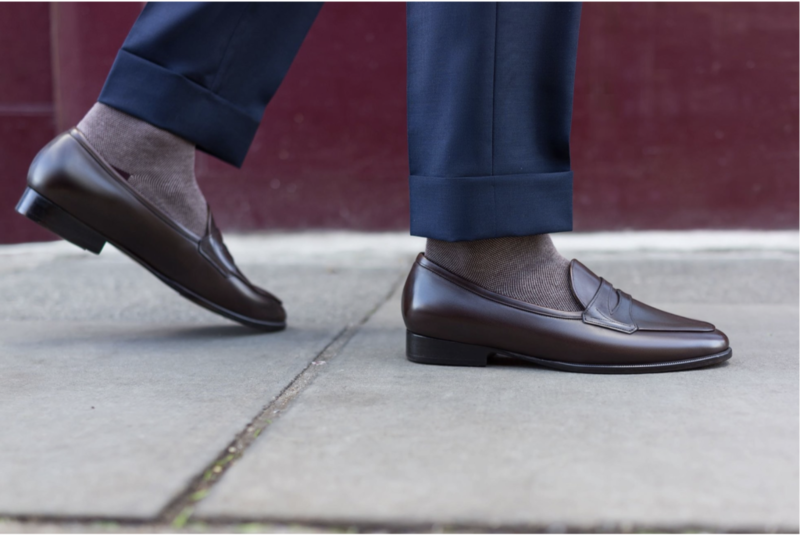 Due to the loafer being rather soft and with a thin sole, I would suggest a rubber grip which will prolong the life of your loafers significantly. It costs 23.30€ but worth every penny! Baudoin & Lange have created a truly unique piece of footwear and in my opinion, one of the most comfortable Belgian loafers I have ever owned! There is no equal. This is my first experience with Belgian loafers. I’m pretty sure that, these are the best make and quality you can find. With the brand having announced the new model, it is clear that it will try and further innovate the shoe industry. It will be interesting to see what they come up with next. For more information visit Baudoin & Lange. For any further question please don’t hesitate to contact me! All pictures used are from Baudoin & Lange except for my own three pairs displayed.